Build guitars at home – it is very difficult, but very creative and entertaining. It is possible to understand the manufacture of this tool, you will have to get an old guitarmay need to seek the assistance of the masters of this business. But still there are some General principles of manufacture. For the manufacture of the body of the guitar pick array of dense wood. You can purchase it in specialized stores or ordered via the Internet. When choosing wood, pay attention to the quality of an individual sample – tree fiber should be smooth, there should be no knots. Regarding the choice of the breed, the most commonly used spruce and pine. Although, the experts in this case with disapproval look at a guitar made of solid pine, but in the right hands he can turn into a great guitar.To opt for any material, tap it – if you like the sound, take it without hesitation. Select a room, which will serve you shop. The size of the room should allow you to freely accommodate there with a guitar and all the instruments, and the humidity of the air in this improvised workshop should not exceed 60%. To start, try to make a new guitar from the old factory. Surely someone of your friends is such a broken, worn out, almost sounding guitar. And even if not, try to look for ads for the sale of these guitars – sometimes they even give them for free. Disassemble the guitar, carefully study its structure and try to collect back. Replace old strings, Polish the fretboard, align it. If the guitar has some broken elements, for example, splitting, replace them with new ones. Polish the guitar and paint. Certainly the sound of a guitar will improve. To build your own guitar, make markup of all the details. Saw them using a jigsaw or saws. The details of customize guitars to each other with millimeter precision – the smallest imperfection can ruin the sound. 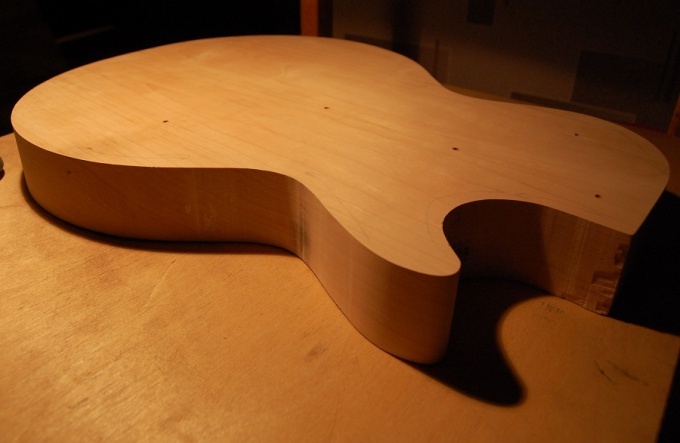 To handle the guitar body, use a plane – the surface must be perfectly smooth.After Assembly of the basic details, attach the tuning pegs, pull the string and listen to the sound of the guitar. If she doesn't, then you need to finalize details. When you're done, cover the hull with varnish and leave to dry. By the way, and sold special sets to build guitars. All the details are already there, it only remains to put them together. However, it is not clear what purpose purchased these sets, because if you decide to make your own guitar, so you want to create a tool that's perfect for you and meets required specifications. But you can try to purchase this set. Keep in mind that making your own guitar you might spend a lot more than a new good guitar.